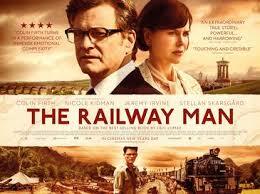 The Railway Man is an emotionally powerful film based on the true story of Eric Lomax. Eric (Colin Firth) meets Patti (Nicole Kidman) on a train. We’re on a quick romantic journey to marriage but soon discover Eric’s Post-Traumatic Stress Disorder (PTSD), which is linked to brutal torture as a POW. The severe PTSD symptoms threaten to destroy his relationship along with his life. We’re in a time shuffle from the relationship and early marriage in the 1980s to WWII. Lomax was a British officer sent to railway work as a slave of the Japanese when Singapore fell in 1942. After his marriage, Eric discovers one of his Japanese torturers, Nagase, is alive. Now the gut-wrenching inner struggle takes place on a larger stage. The war is not over for either man. Rather than reveal the dramatic and unpredictable conclusion, I’ll stop with the story-telling. Clinicians like me have seen many people with PTSD. The portrayal of Eric’s struggle is incredibly moving. Denial followed by torment, anger, and anxiety is palpable as is Eric’s drive to survive rather than succumb. The Railway Man is based on Eric Lomax’ memoir. I have not read the book but understand from summaries that the film is close to the story except for some aspects of the ending. I'd rate the film 4 of 5 stars. The only negative for me was the awkward shuffling between the present and the past. I also wanted to know more about Eric's wife but that may have been too much for a standard screen time.